The industry’s new best of breed. Our customers told us exactly what they’re looking for in a gas monitoring solution: reliability, simplicity and ease of use. The new iSeries platform delivers on all counts- and than goes a step farther. A specialty trace level product line is the Model 42i-Y NOy analyzer. Using chemiluminescence technology the Model 42i-Y measures the amount of nitrogen oxides in the air from sub ppb levels up to 100ppm. The Model 42i-Y is a single photomultiplier tube design that measures NOy which includes most oxides of nitrogen with the exception of NH3 and N2O. Dual range and auto range are standard features in this instrument. Because the instrument is operated continuously in the NOy mode, the response time is less than 10 seconds. 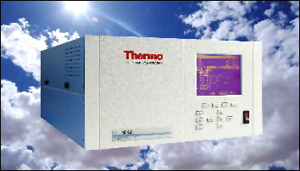 This state of the art gas analyzer offers features such as an ethernet port as well as flash memory for increased data storage and field upgradeability. Ethernet connectivity provides efficient remote access, allowing the user to down load measurement information directly from the instrument without having to be on-site. You can easily program soft-keys to allow you to jump directly to frequently accessed functions, menus or screens. The larger interface screen display measurement information and status, while viewing menu and operational screens. For more information visit the Model 42i Y NOy Analyzer Webpage.